In 1947 Pius XII wrote Fulgens Radiatur, an encyclical on St Benedict. In 1980, to celebrate the 1500th anniversary of his birth, St John Paul II was a pilgrim to Norcia & wrote Sanctorum Altrix, an apostolic letter on this Messenger of Peace. JPII also wrote a letter to the Abbot of Subiaco in 1999. 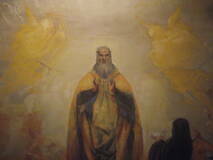 Pope Benedict XVI visited Monte Cassino on Feast of the Ascension 2009 & gave a catechesis on St Benedict. "When St Benedict fled to Subiaco, many wanted to come and lead the life he was embarking on and they wanted him as their leader. So he wrote his rule, a wonderful document well known for its humanity and its simplicity of living, much of it going into considerable detail about how to pray what is called the Divine Office in Church, but preceded and followed by some wonderful spiritual advice to people who wanted to lead the monastic life. .. For a Benedictine, a monk takes 3 vows - obedience, stability and a third vow called 'conversatio morum' which is really conversion of life. For me, that's a wonderful vow because it gives one the whole of one's life to convert into a better way of life and that ties in so much with St Benedict's idea of a monk never despairing of the love and the mercy of God, and that continues right through one's life." "He had such a strong faith that he was able to really understand what God wanted out of him and thereby really enabled great things to happen. Many of his monasteries still exist today, including Monte Cassino." ".. The name "Benedict" also calls to mind the extraordinary figure of the great "Patriarch of Western Monasticism", St Benedict of Norcia, Co-Patron of Europe together with Sts Cyril and Methodius, and the women Saints, Bridget of Sweden, Catherine of Siena and Edith Stein. The gradual expansion of the Benedictine Order that he founded had an enormous influence on the spread of Christianity across the Continent. St Benedict is therefore deeply venerated, also in Germany and particularly in Bavaria, my birthplace; he is a fundamental reference point for European unity and a powerful reminder of the indispensable Christian roots of his culture and civilization. We are familiar with the recommendation that this Father of Western Monasticism left to his monks in his Rule: "Prefer nothing to the love of Christ" (Rule 72, 11). At the beginning of my service as Successor of Peter, I ask St Benedict to help us keep Christ firmly at the heart of our lives. May Christ always have pride of place in our thoughts and in all our activities!" Today, I would like to speak about Saint Benedict, the Founder of Western monasticism, and also the Patron of my pontificate. I begin with the words of St Gregory the Great, who writes about St Benedict: "The man of God who shone on this earth with so many miracles was just as brilliant in the eloquent exposition of his teaching" (Dial II, 36). The great Pope wrote these words in the year 592; the holy monk had died just 50 years earlier and was still alive in the memory of the people and above all in the thriving religious Order founded by him. St Benedict of Norcia, with his life and work, has had a fundamental influence on the development of European civilization and culture. The most important source on his life is the second book of the Dialogues of St Gregory the Great. It is not a biography in the classical sense. In accordance with the ideas of his time, he wanted to illustrate through the example of a real man - of Saint Benedict (in this case) - the ascent to the peaks of contemplation, which can be realised by those who abandon themselves to God. Thus he gives us a model of human life as a climb towards the summit of perfection. In this book of the Dialogues St Gregory the Great also recounts many miracles performed by the Saint, and here too he does not simply wish to recount something curious, but to show how God, by admonishing, helping and even punishing, intervenes in the concrete situations of the life of man. He wants to show that God is not a distant hypothesis placed at the origin of the world, but is present in the life of man, of every man. This perspective of the "biographer" is also explained in light of the general context of his time: in between the 5th and 6th centuries, the world was shaken by a tremendous crisis of values and of institutions, caused by the collapse of the Roman Empire, by the invasion of new peoples and by the decay of morals. 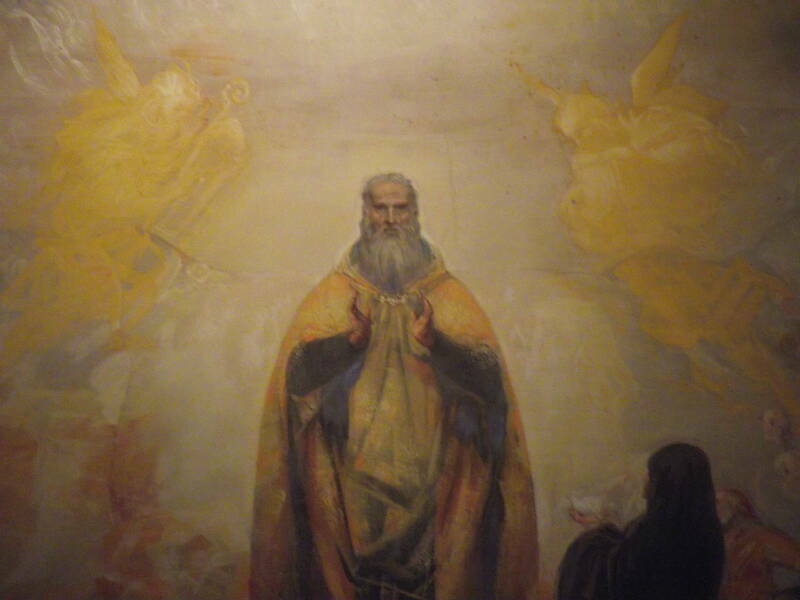 With the presentation of St Benedict as a "luminous star", Gregory wanted to indicate in this terrible situation, here, in this very city of Rome, the way out of the "dark night of history" (cf John Paul II, Teachings, II/1, 1979 p1158). In fact, the work of the Saint and, in a particular way, his Rule were to prove bearers of an authentic spiritual leaven, which over the centuries changed the face of Europe, far beyond the borders of his country and his time, by kindling after the fall of the political unity created by the Roman Empire, a new spiritual and cultural unity, that of the Christian faith shared by the peoples of the Continent. It was thus that the reality that we call "Europe" came to be born. 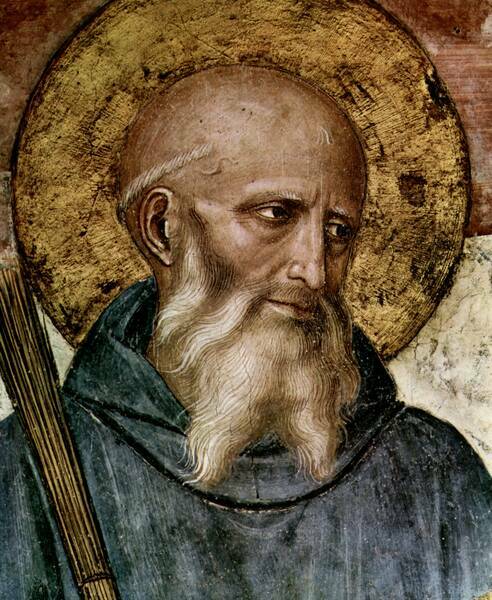 St Benedict was born around the year 480. He came, as St Gregory says, "ex provincia Nursiae" - from the region of Norcia. His wealthy parents sent him to study in Rome. However he did not stay long in the Eternal City. As a fully plausible explanation, Gregory mentions that the young Benedict was put off by the dissolute lifestyle of many of his fellow students, and did not want to make the same mistakes. He wanted to please God alone: "soli Deo placere desiderans" (II Dial, Prol 1). Thus, even before the conclusion of his studies, Benedict left Rome and withdrew to the solitude of the mountains east of Rome. After a short stay in the village of Enfide (today, Affile), where for a time he lived with a "religious community" of monks, he became a hermit in the nearby Subiaco. He lived there for three years completely alone in a cave which, since the High Middle Ages, constitutes the "heart" of a Benedictine Monastery, called the "Sacro Speco". The period in Subiaco, a period of solitude with God, was for Benedict a time of maturation. Here he had to bear and overcome the three fundamental temptations of every human being: the temptation of self-affirmation and desire to put oneself at the centre, the temptation of sensuality and, lastly, the temptation of anger and revenge. Indeed, it was Benedict's conviction that, only after having overcome these temptations, would he be able to say a useful word to others about their own situations of need. And so, having reconciled his soul, he was fully able to control the impulses of the ego, so as thus to be a creator of peace around him. Only then did he decide to found his first monasteries in the valley of the Anio, near Subiaco. In the year 529 Benedict left Subiaco so as to settle in Monte Cassino. Some have explained this move as an escape from the intrigues of an envious local cleric. But this attempt at an explanation has proved unconvincing, since the latter's sudden death did not induce Benedict to return (II Dial 8). In reality, this decision was called for because he had entered a new phase of inner maturity and of monastic experience. According to Gregory the Great, the exodus from the remote valley of the Anio to Monte Cassio - a hill which, dominating the vast surrounding plain, is visible from afar - has a symbolic character: a hidden monastic life has its own raison d'être, but a monastery has also its own public finality in the life of the Church and of society, it must give visibility to the faith as a force of life. Indeed, when, on 21 March 547, Benedict concluded his earthly life, he left with his Rule and with the Benedictine family founded by him a heritage that down the centuries has born and still bears fruit all over the world. Throughout the second book of the Dialogues Gregory illustrates to us how St Benedict's life was immersed in an atmosphere of prayer, the foundation of his existence. Without prayer there is no experience of God. But Benedict's spirituality was not an interiority outside of reality. In the anxiety and confusion of his time, he lived under the gaze of God and as such never lost sight of the duties of daily life and of man with his concrete needs. By seeing God, he understood the reality of man and his mission. In his Rule he describes monastic life as "a school of the service of the Lord" (Prol 45) and asks his monks "let nothing be preferred to the Work of God" [that is, to the Divine Office or the Liturgy of the Hours]" (43, 3). He underlines, however, that prayer is in the first place an act of listening (Prol 9-11), which must then be translated into concrete action. "The Lord is waiting for us to respond every day with facts to his holy teachings", he affirms (Prol 35). Thus the life of the monk becomes a fruitful symbiosis between action and contemplation "so that in all things God may be glorified" (57, 9). 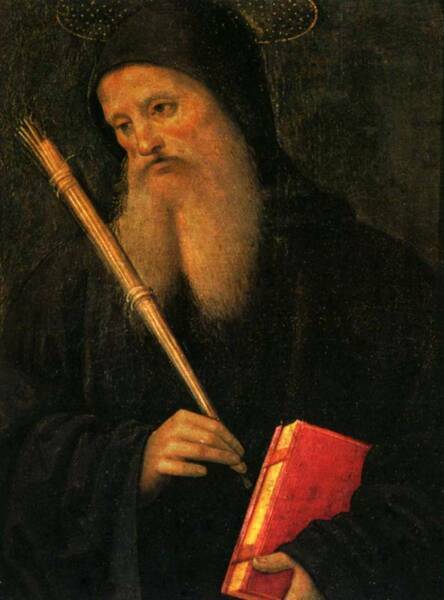 In contrast with a facile and egocentric self-fulfilment, often exalted today, the first and indispensable commitment of a disciple of St Benedict is the sincere search for God (58, 7) on the way mapped out by the humble and obedient Christ, whose love he must put before all else (4, 21; 72, 11) and thus, in the service of the other, he becomes a man of service and peace. In the exercise of obedience put into action with a faith animated by love (5, 2), the monk achieves humility (5, 1), to which the Rule dedicates an entire chapter (7). In this way man becomes ever more conformed to Christ and attains true self-fulfilment as a creature in the image and likeness of God. The obedience of the disciple must correspond with the wisdom of the Abbot, who in the monastery holds "the place of Christ" (2, 2; 63, 13). His figure, outlined above all in second chapter of the Rule, with a profile of spiritual beauty and demanding commitment, can be considered a self-portrait of Benedict, since - as St Gregory the Great writes - "the Saint could not teach otherwise than as he himself lived" (Dial 11, 36). The Abbot must be both a tender father and also a strict teacher (2, 24), a true educator. Inflexible against vices, he is nevertheless above all called to imitate the tenderness of the Good Shepherd (27, 8), to "help rather than to dominate" (64, 8), to "accentuate more with deeds that with words all that is good and holy" and to "illustrate the divine commandments by his example" (2, 12). To be able to decide responsibly, the Abbot must also be someone who listens to "the advice of his brothers" (3, 2), because "the Lord often reveals to the youngest the best solution" (3, 3). This provision renders surprisingly modern a Rule written almost 15 centuries ago! A man of public responsibility, even in small circles, must also always be a man who knows how to listen and knows how to learn from what he hears. Benedict describes the Rule as "minimal, tracing only an initial outline" (73, 8); in reality, however, it offers useful directions not only to monks, but also to all those who seek guidance on their pathway to God. For its measure, humanity and sober discernment between the essential and the secondary in spiritual life, it has been able to maintain its illuminating force all the way up to the present time. Paul VI, by proclaiming St Benedict Patron of Europe on 24 October 1964, intended to recognize the marvellous work accomplished by the Saint through his Rule for the formation of European civilization and culture. Today Europe - having just exited a century deeply wounded by two World Wars and then the collapse of the great ideologies that were revealed as tragic utopias - is in search of its own identity. In order to create new and lasting unity, political, economic and juridical instruments are certainly important, but an ethical and spiritual renewal must also be awakened which draws upon the Christian roots of the Continent, otherwise Europe cannot be rebuilt. Without this vital sap, man remains exposed to the danger of succumbing to the age-old temptation of wanting to redeem himself by himself - a utopia which, in different ways, in 20th century Europe has caused, as Pope John Paul II pointed out, "a regression without precedent in the tormented history of humanity" (Address to the Pontifical Council for Culture, 12 January 1990). In seeking true progress, let us too listen today to the Rule of St Benedict as a light on our pathway. The great monk remains a true master at whose school we can learn the art of living true humanism." Messenger of peace, molder of union, magister of civilization, and above all herald of the religion of Christ and founder of monastic life in the West: these are the proper titles of exaltation given to St Benedict, Abbot. At the fall of the crumbling Roman Empire, while some regions of Europe seemed to have fallen into darkness and others remained as yet devoid of civilization and spiritual values, he it was who, by constant and assiduous effort, brought to birth the dawn of a new era. It was principally he and his sons, who with the cross, the book and the plough, carried Christian progress to scattered peoples from the Mediterranean to Scandinavia, from Ireland to the plains of Poland (cf AAS 39 (1947), p453). With the cross; that is, with the law of Christ, he lent consistency and growth to the ordering of public and private life. To this end, it should be remembered that he taught humanity the primacy of divine worship through the “opus Dei”, ie through liturgical and ritual prayer. Thus it was that he cemented that spiritual unity in Europe, whereby peoples divided on the level of language, ethnicity and culture felt they constituted the one people of God; a unity that, thanks to the constant efforts of those monks who followed so illustrious a teacher, became the distinctive hallmark of the Middle Ages. It is this unity, which St Augustine calls the “exemplar and type of absolute beauty” but which regrettably has been broken through a maze of historical events, that all men of good will even in our own day seek to rebuild. With the book, then, ie with culture, the same St Benedict - from whom so many monasteries derive their name and vigor - with providential care, saved the classical tradition of the ancients at a time when the humanistic patrimony was being lost, by transmitting it intact to its descendents, and by restoring the cult of knowledge. Lastly, it was with the plough, ie, with the cultivation of the fields and with other similar initiatives, that he succeeded in transforming wastelands gone wild into fertile fields and gracious gardens; and by uniting prayer with manual labour, according to his famous motto “ora et labora”, he ennobled and elevated human work. Rightly, therefore, did Pius XII salute St Benedict as the “father of Europe” (cf AAS); for he inspired in the peoples of Europe that loving care of order and justice that forms the foundation of true society. Our same Predecessor desired that God, through the merits of this great saint, second the efforts of all those seeking to unite the nations of Europe in fraternal bonds. In his paternal solicitude, John XXIII also greatly desired this to come about. It is natural, then, that We also give our full assent to this movement that tends toward the attainment of European unity. For this reason, we gladly welcomed the requests of many cardinals, archbishops, bishops, superior generals of religious orders, rectors of universities and other distinguished representatives of the laity from the various European nations to declare St Benedict the Patron of Europe. And in the light of this solemn proclamation, today’s date appears to Us particularly appropriate, for on this day We re-consecrate to God, in honour of the most holy Virgin and St Benedict, the temple of Montecassino, which having been destroyed in 1944 during the terrible world conflict, was reconstructed through the tenacity of Christian piety. This we do most willingly, repeating the actions of several of Our Predecessors, who personally took steps throughout the centuries towards the dedication of this center of monastic spirituality, which was made famous by the sepulcher of St Benedict. May so remarkable a saint receive our vow and, as he once dispelled the darkness by the light of Christian civilization and radiated the gift of peace, may he now preside over all of European life and by his intercession develop and increase it all the more. Therefore, as proposed by the Sacred Congregation of Rites, and after due consideration, in virtue of Our apostolic power, with the present Brief and in perpetuity we constitute and proclaim St Benedict, Abbot, the Principle heavenly Patron of all Europe, granting every honour and liturgical privilege due by law to primary Protectors. Notwithstanding any provision to the contrary. This we make known and establish, deciding that the present Letter remain valid and effective, that it obtain its full and integral effect and be respected by all those it regards or shall regard in future; so also, may whatever judgment or definition be in accordance with it; and henceforth, may whatever contrary act, by whatever authority it was established, consciously or through ignorance, be deemed invalid. Given in Rome, at St. Peter’s, the 24th of October in the year 1964, the second of Our Pontificate. 1. Ho appreso con gioia che la grande Famiglia monastica benedettina intende ricordare con speciali celebrazioni i 1500 anni da quando san Benedetto diede inizio in Subiaco a quella "schola dominici servitii" che avrebbe condotto, nel corso dei secoli, una schiera innumerevole di uomini e di donne, "per ducatum Evangelii", ad una più intima unione con Cristo. Desidero associarmi spiritualmente al rendimento di grazie che l'intero Ordine monastico, nato dalla fede e dall'amore del santo Patriarca, eleva al Signore per i grandi doni di cui è stato arricchito sin dagli inizi della sua storia. Già il mio venerato predecessore, san Gregorio Magno, monaco benedettino ed illustre biografo di san Benedetto, invitava a cogliere nel clima di grande fede in Dio e di intenso amore alla sua legge, che animava la famiglia d'origine del Santo di Norcia, le premesse di una vita interamente dedicata a "cercare e servire Cristo, unico e vero Salvatore" (Prefazio della Messa di san Benedetto). Questa spirituale tensione, accrescendosi e sviluppandosi nel confronto con le vicende della vita, condusse ben presto il giovane a rinunciare alle lusinghe della scienza e dei beni del mondo, per dedicarsi ad acquisire la sapienza della Croce ed a conformarsi unicamente a Cristo. Da Norcia a Roma, da Affile a Subiaco, il cammino spirituale di Benedetto fu guidato dall'unico desiderio di piacere a Cristo. Questo anelito si consolidò e si accrebbe nei tre anni vissuti nella grotta del Sacro Speco, quando "gettò quelle solide basi di cristiana perfezione, sulle quali avrebbe in seguito potuto innalzare una costruzione di straordinaria altezza" (Pio XII, Fulgens radiatur, 21 marzo 1947). La prolungata ed intima unione con Cristo lo spinse a raccogliere intorno a sé altri fratelli per realizzare "quei disegni e propositi grandiosi a cui era chiamato dall'afflato dello Spirito Santo" (ibid.). Arricchito dalla luce divina, Benedetto divenne luce e guida per i poveri pastori in cerca di fede e per la gente devota bisognosa di essere accompagnata nella via del Signore. Dopo un ulteriore periodo di solitudine e di dure prove, 1500 anni fa, appena ventenne, fondò a Subiaco, non lontano dallo Speco, il primo monastero benedettino. In tal modo, il chicco di frumento che aveva scelto di nascondersi in terra sublacense e di marcire nella penitenza per amore di Cristo, diede inizio ad un nuovo modello di vita consacrata, trasformandosi in spiga turgida di frutti. 2. La piccola ed oscura grotta di Subiaco divenne così la culla dell'Ordine benedettino, dalla quale si sprigionò un faro luminoso di fede e di civiltà che, attraverso gli esempi e le opere dei figli spirituali del santo Patriarca, inondò, come ricorda la lapide marmorea ivi collocata, l'Occidente e l'Oriente europeo e gli altri continenti. La fama della sua santità attirò schiere di giovani in cerca di Dio, che il suo genio pratico organizzò in dodici monasteri. Qui, in un clima di semplicità evangelica, di fede viva e di carità operosa si formarono san Placido e san Mauro, prime splendide gemme della famiglia monastica sublacense, che lo stesso Benedetto educò "al servizio dell'Onnipotente". Per proteggere i suoi monaci dalle conseguenze di una feroce persecuzione, dopo aver perfezionato l'ordinamento dei monasteri esistenti con la costituzione di superiori idonei, Benedetto prese con sé alcuni monaci e partì per Cassino, dove fondò il monastero di Montecassino, che sarebbe presto diventato culla di irradiazione del monachesimo d'Occidente e centro di evangelizzazione e di umanesimo cristiano. Anche in questa vicenda Benedetto si mostrò uomo di fede senza tentennamenti: fidandosi di Dio e sperando come Abramo contro ogni speranza, credette che il Signore avrebbe continuato a benedire la sua opera, nonostante gli ostacoli posti dall'invidia e dalla violenza degli uomini. 3. Al centro dell'esperienza monastica di san Benedetto c'è un principio semplice, tipico del cristiano, che il monaco assume nella sua piena radicalità: costruire l'unità della propria vita intorno al primato di Dio. Questo "tendere in unum", prima e fondamentale condizione per entrare nella vita monastica, deve costituire l'impegno unificante dell'esistenza del singolo e della comunità, traducendosi nella "conversatio morum", che è fedeltà ad uno stile di vita concretamente vissuto nell'obbedienza quotidiana. La ricerca della semplicità evangelica impone una verifica costante, lo sforzo cioè di "fare la verità" risalendo continuamente al dono iniziale della chiamata divina, che è all'origine della propria esperienza religiosa. Questo impegno, che accompagna la vita benedettina, è particolarmente sollecitato dalle celebrazioni dei 1500 anni di fondazione del Monastero, le quali cadono nel corso del Grande Giubileo del 2000. Il Libro del Levitico prescrive: "Dichiarerete santo il cinquantesimo anno e proclamerete la liberazione nel paese per tutti i suoi abitanti. Sarà per voi un giubileo; ognuno di voi tornerà nella sua proprietà e nella sua famiglia" (25, 10). L'invito a ritornare alla propria "eredità", alla propria famiglia risulta particolarmente attuale per la Comunità monastica benedettina, chiamata a vivere il Giubileo dei suoi quindici secoli di vita e quello dell'Anno Santo come momenti propizi di rinnovata adesione all'"eredità" del santo Patriarca, approfondendone il carisma originario. 4. L'esempio di san Benedetto e la stessa Regola offrono significative indicazioni per accogliere pienamente il dono costituito da tali ricorrenze. Invitano innanzitutto ad una testimonianza di tenace fedeltà alla Parola di Dio, meditata ed accolta attraverso la "lectio divina". Ciò suppone la salvaguardia del silenzio e un atteggiamento di umile adorazione dinanzi a Dio. La Parola divina, infatti, rivela le sue profondità a colui che si fa attento, mediante il silenzio e la mortificazione, all'azione misteriosa dello Spirito. La prescrizione del silenzio regolare, mentre stabilisce tempi in cui la parola umana deve tacere, orienta verso uno stile improntato a una grande moderazione nella comunicazione verbale. Se percepito e vissuto nel suo senso profondo, ciò lentamente educa all'interiorizzazione, grazie alla quale il monaco si apre ad una conoscenza autentica di Dio e dell'uomo. Particolarmente il grande silenzio nei monasteri ha una forza simbolica singolare di richiamo a ciò che realmente vale: la disponibilità assoluta di Samuele (cfr 1 Sam 3) e la consegna piena di amore di se stessi al Padre. Tutto il resto non è rimosso, ma assunto nella sua realtà profonda e portato davanti a Dio nella preghiera. E' questa la scuola della "lectio divina" che la Chiesa attende dai monasteri: in essa non si cercano tanto maestri di esegesi biblica, rinvenibili anche altrove, quanto testimoni di un'umile e tenace fedeltà alla Parola nel poco appariscente registro della quotidianità. Così la "vita bonorum" diviene "viva lectio", comprensibile anche da chi, deluso dall'inflazione delle parole umane, cerca essenzialità e autenticità nel rapporto con Dio, pronto a cogliere il messaggio emergente da una vita in cui il gusto della bellezza e dell'ordine si coniugano con la sobrietà. La consuetudine con la Parola, che la Regola benedettina garantisce riservando ad essa un largo spazio nell'orario quotidiano, non mancherà di infondere serena fiducia, escludendo false sicurezze e radicando nell'anima il senso vivo della totale signoria di Dio. Il monaco è così salvaguardato da interpretazioni accomodanti o strumentali della Scrittura ed introdotto ad una consapevolezza sempre più profonda dell'umana debolezza, in cui splende la potenza di Dio. 5. Accanto all'ascolto della Parola di Dio, l'impegno della preghiera. Il monastero benedettino è soprattutto luogo di preghiera, nel senso che in esso tutto è organizzato per rendere i monaci attenti e disponibili alla voce dello Spirito. Per tale motivo, la recita integrale dell'Ufficio Divino, che ha il suo centro nell'Eucaristia e ritma la giornata monastica, costituisce l'"opus Dei", nel quale "dum cantamus iter facimus ut ad nostrum cor veniat et sui nos amoris gratia accendat". Alla Parola della Sacra Scrittura il monaco benedettino ispira il suo colloquio con Dio, aiutato in questo dall'austera bellezza della liturgia romana, in cui tale Parola proclamata con solennità o cantata su monodie che sono frutto di intelligenza spirituale delle ricchezze in essa contenute, ha una parte assolutamente preminente in confronto ad altre liturgie, dove l'elemento che più colpisce sono le splendide composizioni poetiche, fiorite sul tronco del testo biblico. Questo pregare con la Bibbia richiede un'ascesi di svuotamento di se stessi che consente di sintonizzarsi con i sentimenti che un Altro pone sulle labbra e fa sorgere nel cuore (ut mens nostra concordet voci nostrae). Nella vita si afferma così il primato della Parola, che domina non perché si imponga costringendo, ma perché discretamente e fedelmente attrae affascinando. Una volta accettata, la Parola scruta e discerne, impone scelte chiare e introduce così, mediante l'obbedienza, nell'historia Salutis compendiata nella Pasqua del Cristo obbediente al Padre (cfr Eb 5, 7-10). E' questa preghiera, memoria Dei, che rende concretamente possibile l'unità della vita nonostante le molteplici attività: queste, come insegna Cassiano, non vengono mortificate ma continuamente ricondotte al loro centro. E' con l'espandersi della preghiera liturgica nella giornata, attraverso la preghiera personale libera e silenziosa dei fratelli, che nel monastero si viene a creare un clima di raccoglimento, grazie al quale gli stessi momenti celebrativi trovano la loro verità piena. In tal modo il monastero diventa "scuola di preghiera", cioè luogo dove una comunità, vivendo intensamente l'incontro con Dio nella liturgia e nei diversi momenti della giornata, introduce quanti cercano il volto del Dio vivente alle meraviglie della vita trinitaria. 6. La preghiera, scandendo nella liturgia le ore della giornata e divenendo orazione personale e silenziosa dei fratelli, costituisce l'espressione e la sorgente prima dell'unità della comunità monastica, che ha il suo fondamento nell'unità della fede. Da ogni monaco si esige un autentico sguardo di fede su di sé e sulla comunità: grazie ad esso ciascuno porta i fratelli e si sente portato da essi - non solo da quelli con cui vive, ma anche da quelli che lo hanno preceduto ed hanno dato alla comunità la sua inconfondibile fisionomia, con le sue ricchezze e i suoi limiti - e insieme con essi si sente portato da Cristo che è il fondamento. Se manca questa concordia di fondo e s'insinua l'indifferenza o persino la rivalità, ogni fratello comincia a sentirsi "uno fra tanti", con il rischio di illudersi di trovare la sua realizzazione in iniziative personali, che lo spingono a cercare rifugio nei contatti con l'esterno, piuttosto che nella partecipazione piena alla vita e all'apostolato comune. Oggi più che mai è urgente coltivare la vita fraterna all'interno di comunità nelle quali si pratica uno stile di amicizia che non è meno vero perché mantiene quelle distanze che salvaguardano la libertà dell'altro. E' questa testimonianza che la Chiesa si attende da tutti i religiosi, ma in primo luogo dai monaci. 7. Auspico di cuore che le celebrazioni dei 1500 anni dall'inizio della vita monastica in Subiaco costituiscano per codesta comunità e per l'intero Ordine benedettino una rinnovata occasione di fedeltà al carisma del santo Patriarca, di fervore nella vita comunitaria, nell'ascolto della Parola di Dio e nella preghiera e di impegno nell'annuncio del Vangelo secondo la tradizione propria della Congregazione sublacense. Possa ogni comunità benedettina proporsi con una sua identità ben definita, quasi "città sul monte", distinta dal mondo circostante, ma aperta e accogliente per i poveri, i pellegrini e quanti sono alla ricerca di una vita di maggiore fedeltà al Vangelo! Con questi voti, che affido all'intercessione della Vergine Santissima, così devotamente venerata ed invocata in codesto monastero e in tutte le comunità benedettine, imparto di cuore a Lei ed ai monaci sublacensi una speciale Benedizione Apostolica.